Apple has just announced its own selection for the best apps of the year for the iPad and iPhone, and we’ve got some surprising winners. iPhone app of the year was probably the most disputed category and there Apple unexpectedly awarded it to Action Movie FX, a video editing app that enhancing your footage with special effects like missile attacks and falling rocks. Figure, an app for creating music was the runner up. Rayman Jungle Run grabbed the best iPhone game of the year award, and the platformer definitely deserves it - it also grabbed the top spot on our own ranking for best mobile games in September when it was released. Letterpress, the vocabulary battle app came in second. For iPad, Paper by 53 snatched the best app award, and this comes as no surprise. The waterpainting app is a piece of art itself, but it also allows you to really use your tablet for creating amazing drawings. For games, it was The Room, an iPad game that also comes a bit as a surprise at least to us. It is a pretty decent puzzle game, with awesome graphics and animations, set in a mystery game environment, but not more than that. While you may not agree with the winners (some of them seem strange to us as well), Apple has a much wider selection of applications and editor’s pick that is definitely worth a second look, so head on to iTunes and see what the company that curates the whole iOS app business thinks is best. Best iPhone app of the year is Google Maps no doubt. But Apple is just too embarrassed to admit. Why draw attention to your failure? Apple will never admit they failed and had to beg Google to rescue them. Your telling me action movie fx is better than google maps? .. The difference was that it was a native app so does not apply and those "extra features" are a huge improvement on what was there before and even apple maps. Especially since it can actually get you where you want to go. 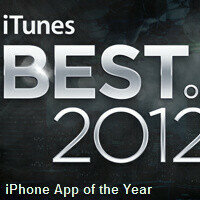 It was too late to be in the running but by far the best app of the year in ios. Bottom line and end of discussion its the first time google maps in its true form as we experience it was finally released as an app in IOS. You can't compare that with an app that let you put explosions and stupid fx in your homemade videos so you can upload more stuff that no one wants to see to facebook and youtube. There is absolutely no comparison.